The gig economy is an example of the changing workforce in our society. With that change comes the challenge of determining the employment status, under the law, of couriers who perform services in the gig economy. The appellate court in New York State recently tackled that challenge in Vega v. Postmates Inc., 162 A.D.3d 1337 (3d. Dept. 2018) and held that such couriers are not employees for the purpose of unemployment insurance benefits. Even though this claim pertained to unemployment insurance benefits, the Third Department notably weighed many of the same factors that the Workers’ Compensation Board relies upon when determining employer-employee relationship vs. independent contractor. Accordingly, it remains to be seen what impact this decision will have on couriers in the gig economy seeking workers’ compensation benefits. In Vega, the claimant was a courier for Postmates Inc., “a web-based platform that allows customers to request on-demand pick-up and delivery service from local restaurants or stores,” and had applied for unemployment insurance benefits after Postmates terminated its relationship with him on the basis of “alleged negative consumer feedback and/or fraudulent activity.” By a split decision of 3-2, the Third Department reversed the Unemployment Insurance Appeal Board’s finding that an employer-employer relationship existed. 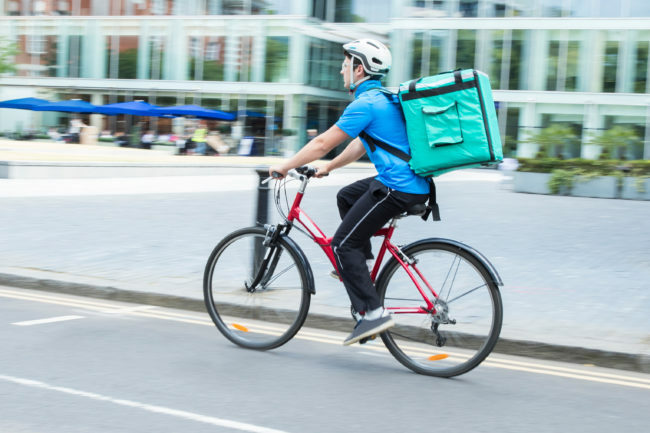 In making its determination of no employer-employee relationship, the Third Department focused on the lack of direction and control that Postmates had over the claimant in his capacity as a courier. It indicated that in order to be a courier the claimant only had to download Postmates’ application software and provide his name, telephone number, social security number, and driver’s license number. The Third Department further noted that the claimant and other couriers were not required to report to a supervisor and retained the discretion to determine when, if at all, he or she logged into the application to perform services. The court emphasized that when logged into the application couriers are free to work as much or as little as desired, their work schedule is not set, there is no minimum time requirement that the courier must remain on the application, and no minimum or maximum requirement for the number of deliveries to be completed. The Third Department further pointed out that couriers can accept, reject, or ignore a delivery request without penalty and have the freedom to simultaneously work for other companies, including direct competitors. Other relevant factors cited by the court included couriers not being required to wear a uniform, not being provided any identification card or logo, and only being paid for completed deliveries to further emphasize the lack of direction and control. While the Third Department acknowledged that Postmates had incidental control over its couriers including determining the rate it paid couriers, tracking the deliveries, and handling customer complaints, it concluded that this did not equate to Postmates Inc. having the “sufficient indicia” of control over the means by which its couriers perform their deliveries. Generally, much as the Third Department did in Vega, the Workers’ Compensation Board closely examines the direction and control over claimants when making a determination of employer-employee relationship. While each case is fact specific and one web-based platform does not necessary exercise direction and control to the same extent as others, this case is persuasive authority to deny couriers in the gig economy workers’ compensation benefits.